Cham say's " Being a Pondy native is a serene place to live on earth! ". Now About Pondicherry in Cham's word's..
Pondicherry, recently crown as Puducherry is my native place. Situated along the coastline of Bay of Bengal, is rich in culture, attracts many tourists around the world.The small coastal city stands alone for his rich and unique history, fought for his own Independence (August 16 is celebrated as Pondicherry Independence) against the French rulers. Dutch were the first to settle down and hand over to the French later.Many freedom activists like Aurobindo and Subramaniam Bharati - tamil Poet took refuge in French territory and acted again the Bristish government.The French people distinguished the city in two main parts: Ville blanche (French quarters) where still French people live. Many French institutions, including French schools, french consulate, oldest Church are located in these beautifully paved road.If you are someone who is looking to stay in peace at Pondy, don’t want to wake up by the street vendors voice, no horn sounds, practically no kids playing, you can hear the lullaby of beach waves! Well, you got to book a hotel in French quartier! Coming to the Indo-Franco cuisine, many Indians (Pondicherrian) stayed in France and moved back to Pondicherry. Their cuisine got a touch of Indo-french style, like spicy steak seasoned with black pepper, savory crepes eaten with chutney! Butternut Squash and Potato Bisque from Asha. 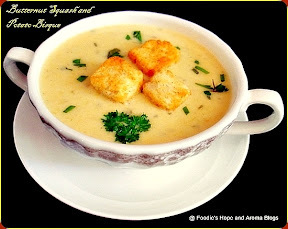 A Nice Flavourfull Bisque, with Indian Vegetables and many Herb's. 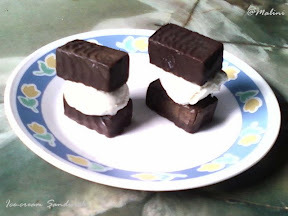 A Indo-French Treat from Asha! Poivrons is Bellpepper in French. 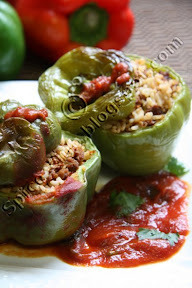 These Bellpeppers are stuffed with Indian style Rice and Soy Granule's and baked. isnt it delicious? Thank You Cham! 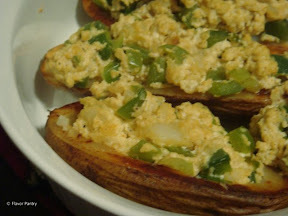 Paneer on Potato cup's baked to perfect is another Indo-french treat from Jamie. Aarthi's first event debut. Welcome Aarthi! 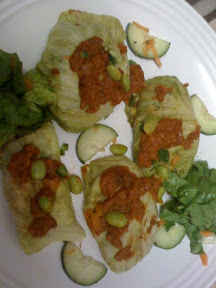 Stuffed Cabbage sound's Great. 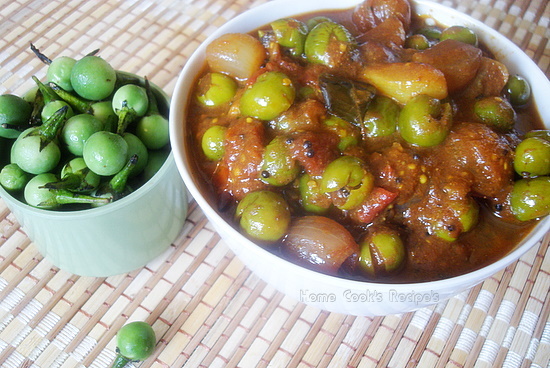 Lovely Colourfull Vegetable Kuruma from Raaga. 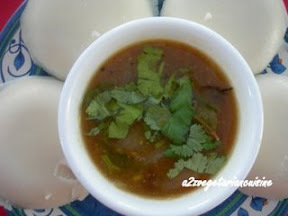 Pooja Prepared these Yummy Shallot Sambhar Sadham for Tamil Cuisine. I want to try this dish soon. Look's absolutely Yum! 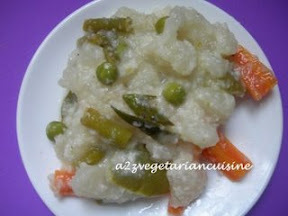 A easy simple curry of vegetables from Aarthi. A Famous Snack we get on Pondicherry Beach. 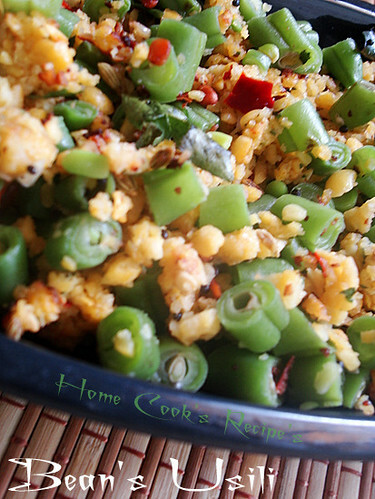 Cool Breeze and spicy sundal on hand is to die for..
A Great dish for Rice to pack for Lunch. My favourite Pesarat-Andhra Special..Thanks Uma..
A2ZVegetarian Cuisine have send a handfull of entries for RCI-Pondicherry. Thank u A2Z. 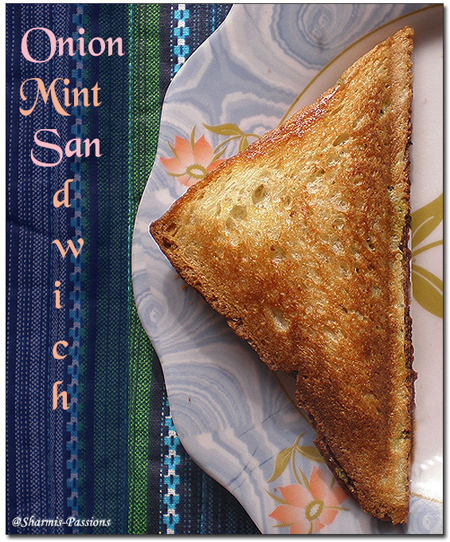 This is a great sandwitch, to have a byte! 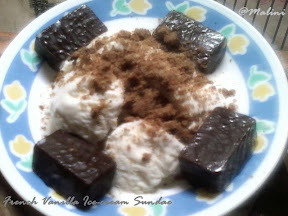 Malini's drool worthy French Vanilla Ice-Cream! 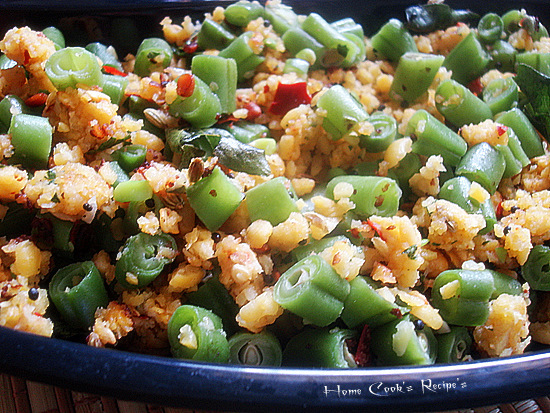 These Green Beans should be yummy with Rasam or Sambhar Rice..
Spongy Idli's and Green Cilantro Chutney beautifully represent a Tamil Break-fast palatte. Thank's for the entry Cilantro! I could'nt do the roundup in time, sorry for the delay. Hope i havent missed any of your entries. if i have missed any of your entries or if you find any broken link's, kindly let me know by mailing to glassofhoney(AT)gmail(dot)com. That will be helpfull! Thank You Participant's for sending me Great entrie's, You all made the event success! Thank You Lakshmi for the wonderfull opportunity given to host RCI-April Edition. Mint and Curry Leave's are like twin sister's. You can pair them both in many of your dish'es. Both help's in digestion. 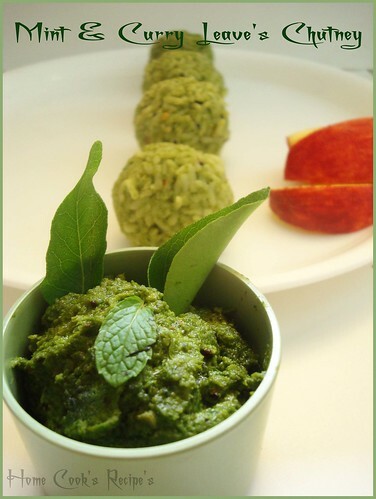 Having Mint Leave's chutney once aweek is good for you. This chutney taste's little bitter, because of the curry leave's. but you should not mind it for a healthy reason. 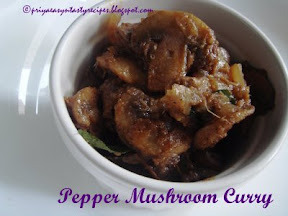 If you are a curry leaf lover like me, then you will definetly love this strong aromatic flavoured chutney. Little tamarind, and coconut add's great taste to this chutney. * Take a Cup of Mint leave's. Wash and saute them in a pan, till they shrink. * A Cup of Curry Leaves should be washed. 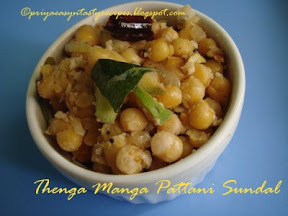 * Have 1/4 cup of grated coconut and a bit of tamarind. 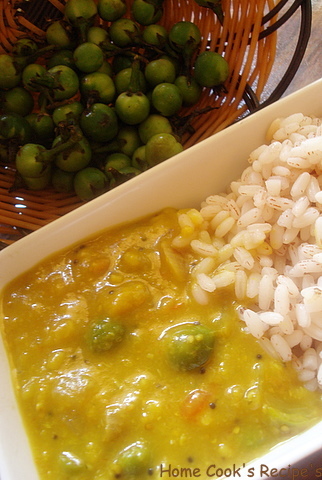 * Heat a tsp of oil in a Tadka pan, add a tsp of urad dal, and fry till it turn golden color. add these urad dal to mint leaves and curry leaves. add 3 dry Red Chilli's, grated coconut, salt to taste and 2 tbsp of water and grind them into a nice paste. 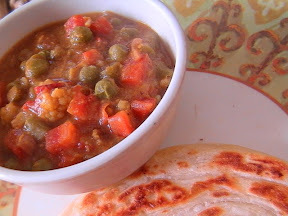 * Heat 1/4 tsp of oil in Tadka pan, add 1/4 tsp mustard seed's, let it pop and add it to the chutney/Thuvayal. 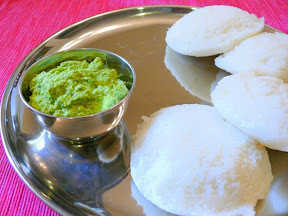 Mix these Thuvaiyal/Chutney with Rice, have rasam on top, for a perfect soothing onto your throat. Sundakaai, was not at all my favourite. one day my Keerakara amma made me buy a pack of sundakka. 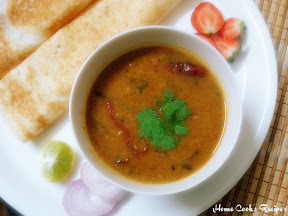 When i tried it in dal, i liked it, it is not as bitter as it is in vathal/dry salted form. Then i tried this karakuzhambhu, we liked it and now iam buying a pack of sundakka, once a month. It improves digestion. Now-a-day's, i take much care to add digestive aid's to the food we cook. The following are some of the digestive friendly, that can be added to our cooking, Ginger-Garlic, corriander seed's, Cumin Seed's, Saunf, corriander leaves, Mint leaves and curry leave's. 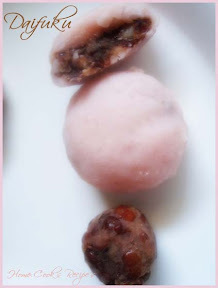 Coming to Sundakka, It is called as Turkey Berry in English. 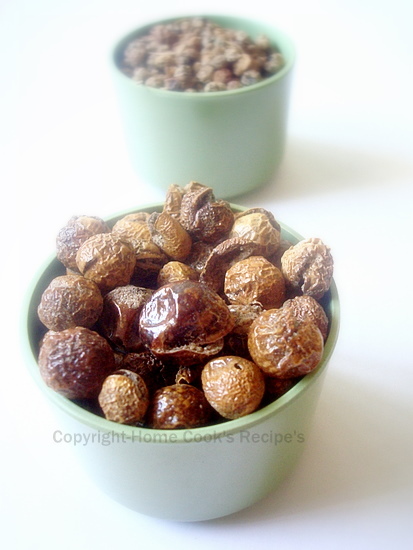 Its vastly used in Tamil cuisine and Thaai Cuisine. Check more about it in Wiki. Again Iam repeating..Green Sundakka don't taste bitter. it just gives a subtle taste. 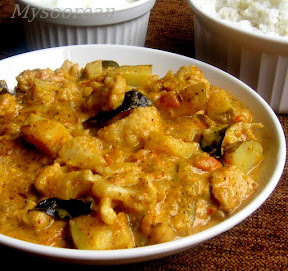 I prepared the kara kuzhambhu, as i prepare Vatha Kuzhambhu, but with less oil. 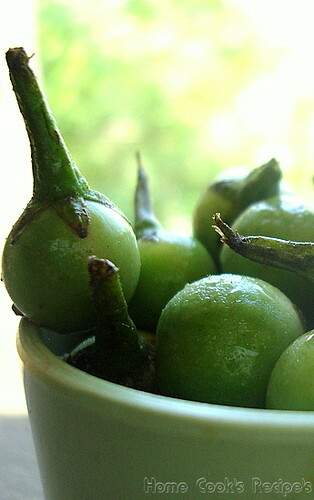 * Remove the stem and Wash the sundakka's and Crush each sundakka or cut them into half and keep aside. 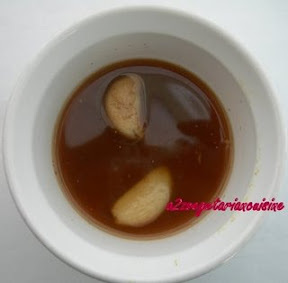 * Soak the Tamarind in half a cup of luke warm water for 5 minute's. 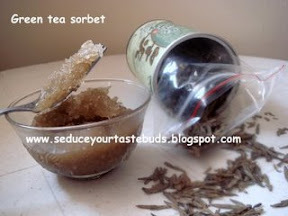 Squeeze the tamarind and get ready with your tamarind water. Add a pinch of turmeric powder, 1 tbsp Corriander powder, 1 tbsp Sambhar Powder and little salt to the tamarind water and mix well. keep it aside. * Get ready with your shallot's and Garlic. 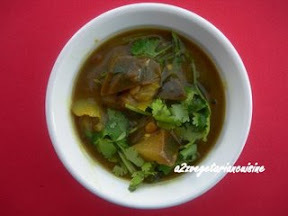 * Now Heat a Thick Bottomed Vessel or kadaai, add oil, when it's heated, add mustard and let it pop. now add methi seed's, curry leave's, garlic and shallot's/small onion's. saute them well. add the finely chopped tomato and saute it along. * Add the sundakkai and saute it for half a minute. Now add the Tamarind water and mix well. Lower the flame and close the kadaai with a lid, and let it sit on low flame for about 10 minutes, till the sundakka gets cooked. 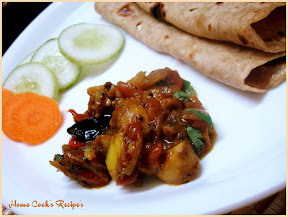 You can prepare this dish, for a person, who have recovered from fever. its really good to improve the taste bud's. and also improves digestion. If you want a home-made medicine to improve your digestion, then here it is. 1. Heat two tbsp of oil in a pan. 2. Put some 10-15 sundakka vathal and fry them for a minute. 3. 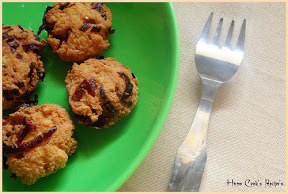 Crush the fried sundakka and put it in a bowl of rice and have a tsp of ghee and mix well with the rice. consume it to improve your digestion. Repeat this for a Week on every meal. 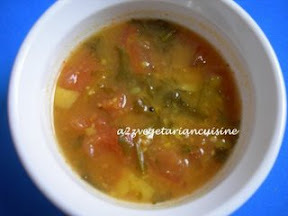 Check my sundakka dal here. its the basic dal recipe. 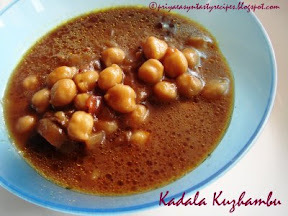 remove the stem of sundakka and crush the sundakka and cook it in a cup pf water for about 5 minute's and then add to the dal. Moong dal is preferred. it tasted so good too..
Have a Great Week end!! Is Killing Innocent people termed as War? I was happily napping one fine afternoon (which is rare these days with a 5.5months old hyperactive baby :)), my tummy started kicking me. Opened the fridge no veggies except for 1 not so fresh beetroot and half a packet of bread. 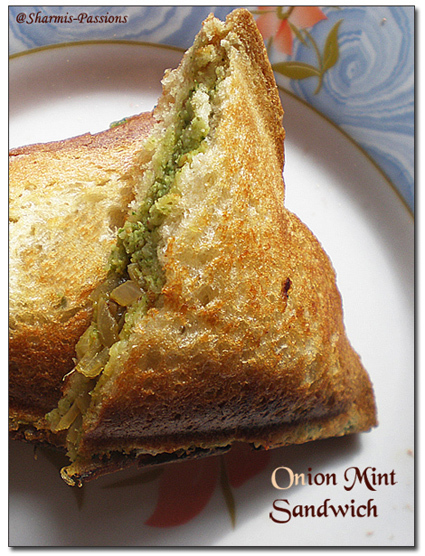 I remembered the left over puthina chutney which I had for idly that morning, so made this quick sandwich. So what are u waiting for.....no veggies in stock try this sandwich with the ingredients that are sure to be in your pantry! 1. 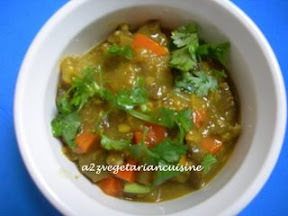 In 1 tsp of oil, add urad dhal, let it temper then add mint leaves and saute well till the leaves are crushed, add few drops of water and grind it to a fine paste. keep it aside. 2. Drizzle oil, add onion, turmeric powder, chilli powder, sambhar powder and saute till the onions turn light brown. 3. 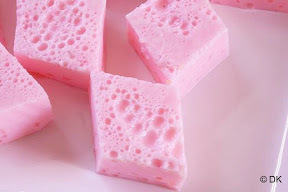 Take 2 bread slices and apply the mint paste on both the slices on one side. 4. Place the onion filling in between the 2 slices and press it. 5. 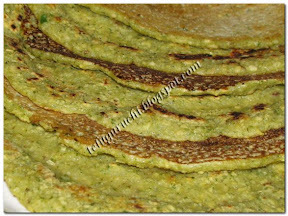 Toast it with ghee in a toaster or in dosa pan. You can substitute the mint leaves with corriander leaves.....It tastes gud too! 'Just not any other dish'. 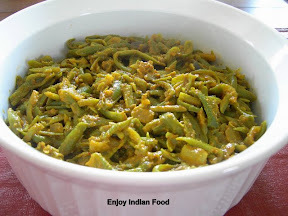 Bean's Poriyal and Beans Usili are the Poriyal's that i cook alternatively every week. 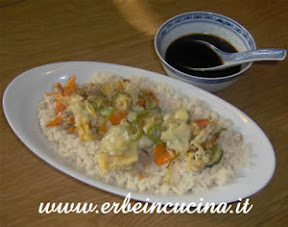 Usili is my favourite, and i love cooking this in microwave for a less oil version of usili. If you feel, that cooking dal's in microwave makes it harder, then you have to sprinkle some water over it, to get them cooked soft. 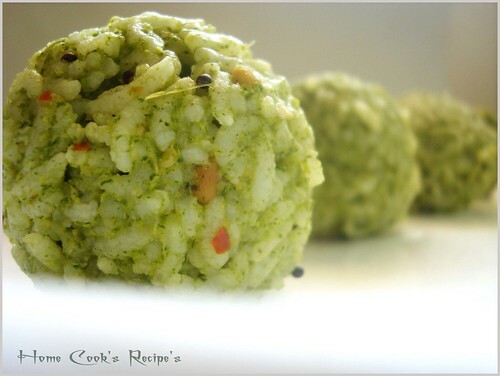 A Protein and Fibre Packed South Indian Poriyal. Soak the Toor,Chana dals and chillies for 2 hours. Drain and Grind them with Saunf/fennel, little salt and with 1 tbsp water into a coarse paste. Crumble them into small pieces. Spread them on a Microwave safe Bowl and Microwave it on High for three minute's. Chop your bean's into half-inch size. and microwave them on high for about 5 minute's. In a pan, Heat oil, add mustard and some saunf. add urad dal, and fry till they turn golden color. add Curry leaves, The microwaved and crumbled dal. coat them with oil and fry them for a minute. Now add the cooked bean's and mix well with the dal. fry them for a minute in a slow flame. 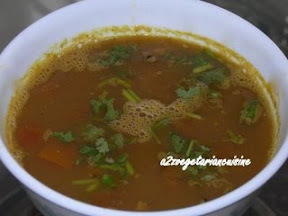 Serve hot with Rasam or kuzhambhu. Why Do we Add Saunf / Sombu ? Fennel seeds can relax the intestines and reduce digestive disorders. 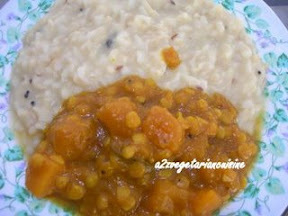 In this way, Hard to digest Dal's easily digest's with the use of saunf. Japanese Food is Flavourfull and its texture is unique and it tastes different too. Rice texture in the form of sushi roll is an example. Cold Udon Noodles is a famous dish, which is served with veggies or tofu. 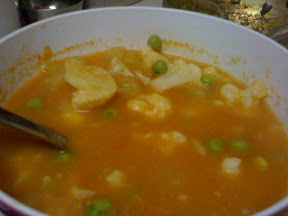 Tofu is added on soup's as it plays a vital role in Japanese Cuisine. Vegetable Tempura, Deep Fried Tofu's are Perfect Vegan Treat. It was a Great Chance for me to learn about Japanese Cuisine, and trying out few recipe's from it. I also had great wrap-up with the blogger's who had send me entry. Thanks DK for the Wonderfull Chance given to me. Hope i have done some justice to it. 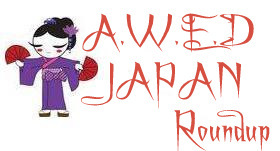 Here I Present A.W.E.D - Japan Roundup. Mugicha (Roasted barley tea) from Cham. 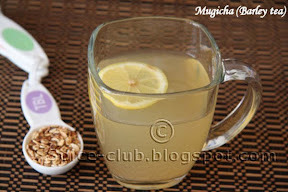 Mugicha (roasted barley tea) is a tisane, made with roasted barley. Very popular drink in Japan. Try this Healthy Drink! Japanese green tea sorbet from PJ. A Perfect Cool Japanese Sorbet for this Summer. Pink Diamonds (Jelly made with Agar-Agar) from DK. Simple, Delicious Pink Diamonds from DK. Thanks for the opportunity given to host A.W.E.D. it was real fun to explore Japanese Cuisine. Kasutera, Japanese Honey Sponge Cake from Asha. 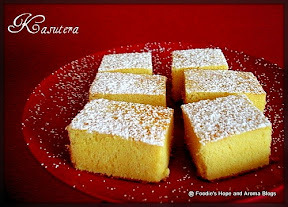 Spongy, Japanese Cake with aroma of honey and dusting of confectioner's sugar on top looks absolutely Delicious. Check out for Sure. 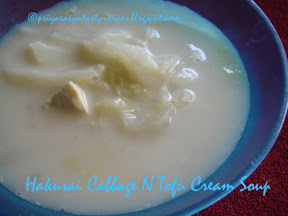 Hakusai Cabbage N Tofu Cream soup from Priya. Simple soup with chinese cabbage, milk, vegetable stock water and tofu. Gyoza from Madhumathi. 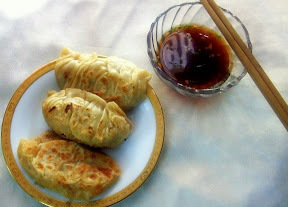 Japanese Dumplings with Cabbage as stuffing served with sauce. 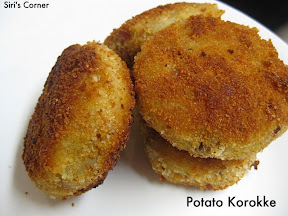 Potato Korokke from Siri. Japanese croquette called 'Korokke'. 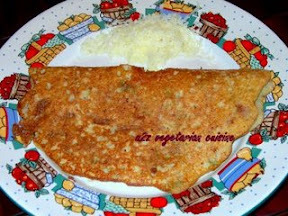 Its usually made with vegetables.Siri has tried it out with mashed potatoes and it looks so Perfect! 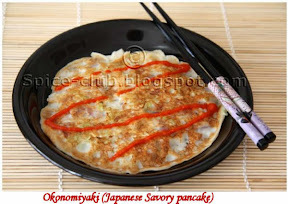 Okonomiyaki (Japanese savory pancake) from Cham. 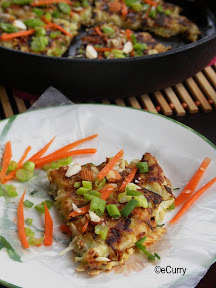 Cabbage and batter are mixed together to make Okonomiyaki, a Japanese savory pancake or pizza. Cham says its ideal for a nivice pancake maker to try. Rainbow Sushi from Simran. 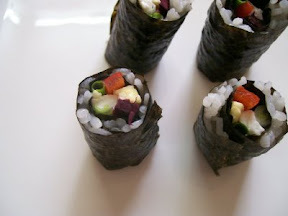 Simran has tried wrapping different colors of veggie's in Sushi Roll. Peeping vegetable's, tempts us to pick up one roll! Kappa Maki (Cucumber Rolls) from Priya. 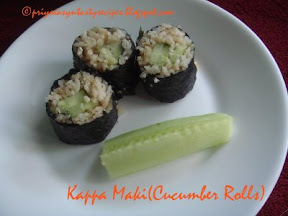 A simple cucumber rolls with sushi rice. Priya Says, Making Sushi Roll is quite easy. 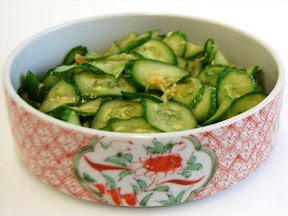 Cucumber Tsukemono from Christine.Tsukemono are Japanese pickles. Worth of Trying! Christine also shares Japanese Spinach Roll in the same post, with sesame dressing that look's great too! 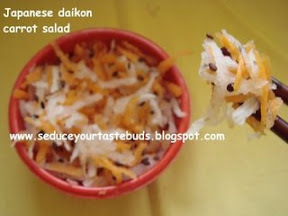 Japanese daikon carrot salad from PJ. 'Daikon' comes from two Japanese words: dai -meaning large and kon-meaning root. PJ has used Carrot and Radish to prepare this Yummy Salad. Cold Udon Noodles with Peanut Sauce from Pavani. Noodles packed with peanutty flavor and packed with veggies. Look's Great! 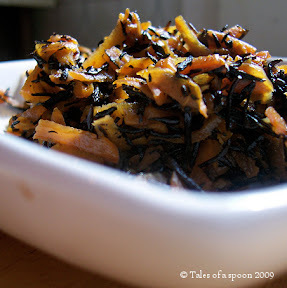 Stewed hijiki seaweed with carrots from Ksenia. 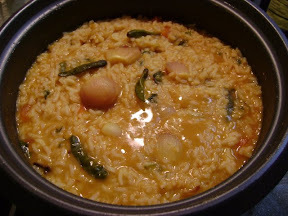 Hijiki is stewed or cooked with other ingredients. This staple is packed with a lot of minerals. a Healthy shot from Ksenia. Okonomiyaki aka "Japanese Pizza" from Soma.Okonomiyaki means “whatever you like, grilled” in Japanese. Soma follows it for an Yummy Pizza for us. 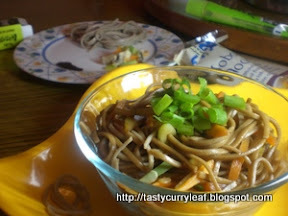 Soba Noodle Salad with Vegetables and Wasabi Sauce from Sweatha.Soba Noodle's with mushroom, zucchini, carrot's and wasabi sauce. Looks Splendid! Udon Noodle Stir fry from DK. 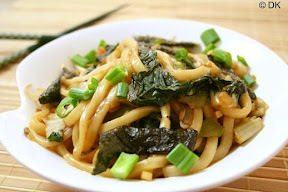 Look out Dk's step by step picture's of this Yummy Healthy Udon Noodle with Green's. Udon Primavera from Meera. 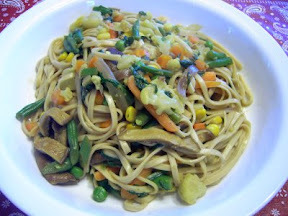 Meera has added some Great Veggie's of her choice to make this Udon a healthy Treat. 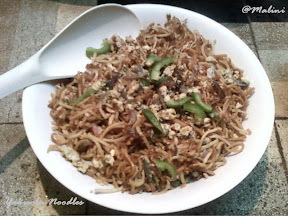 Yakisoba Noodles from Priya.A.W.E.D - Japan event made Priya Venture Japanese Cusine. 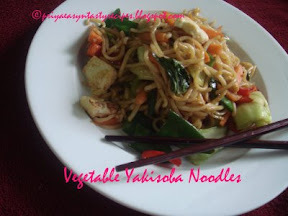 Check out this Yakisoba Noodle's with Tofu and Veggie's. Chilled Sesame Udon Salad from Priya. 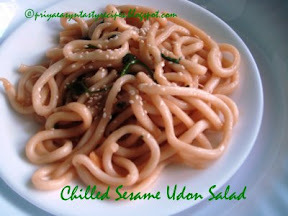 This Chilled Udon Noodle's with Sesame from Priya has to be tried. Vegetarian Tempura from Graziana.Vegetable Tempura with Sweet Potato, Pumpkins and Mushroom. Tempura is a classic Japanese dish of deep fried battered vegetables served on rice. Yakisoba noodles from Malini. Another Yakisoba Noodles with capsicum's. 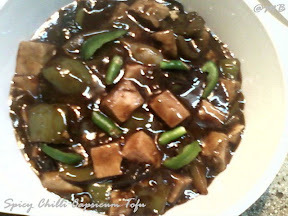 Spicy Chilli Capsicum Tofu from Malini. 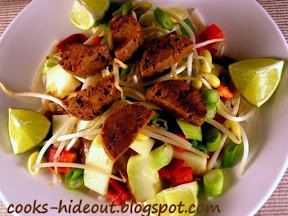 A spicy tofu dish. This should be great with Noodles. Thank You all Participants, You all made this event Look Great and its going to be usefull for the foodie's to try on your recipe's. Hope i have not left any of your entries, if i have left, it might be because of my mistake and please let me know about it by mailing to glassofhoney(AT)gmail(dot)com. Also Have a Look on next A.W.E.D - Srilanka MAY Edition on Siri's blog.